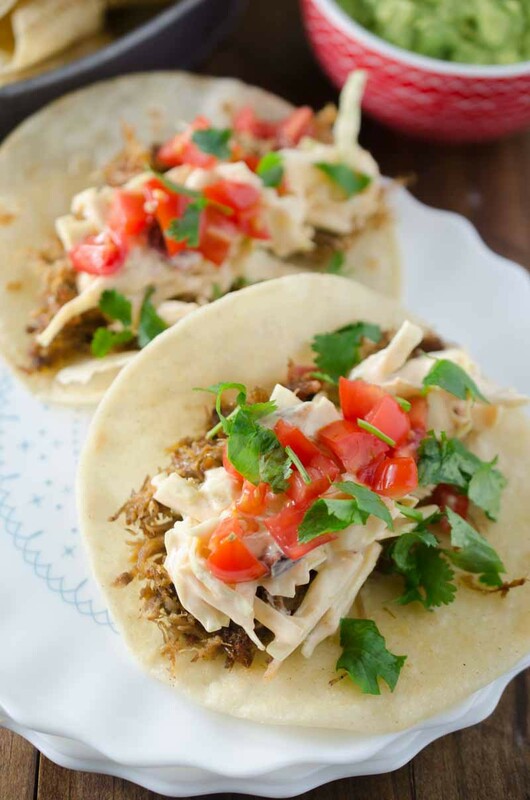 These Pulled Pork Tacos with Chipotle Slaw are packed full of flavor and a great addition to your Taco Tuesday! We had our first official snow day on Monday. And by snow day, I mean it snowed about 3 inches, most of the streets were dry and the city shut down. Schools closed, no garbage, seriously shut down. Funny huh? We just don’t handle snow in the pacific northwest very well. We did put our snow day to good use though! We played in the snow, built snowmen, watched movies and made pulled pork. 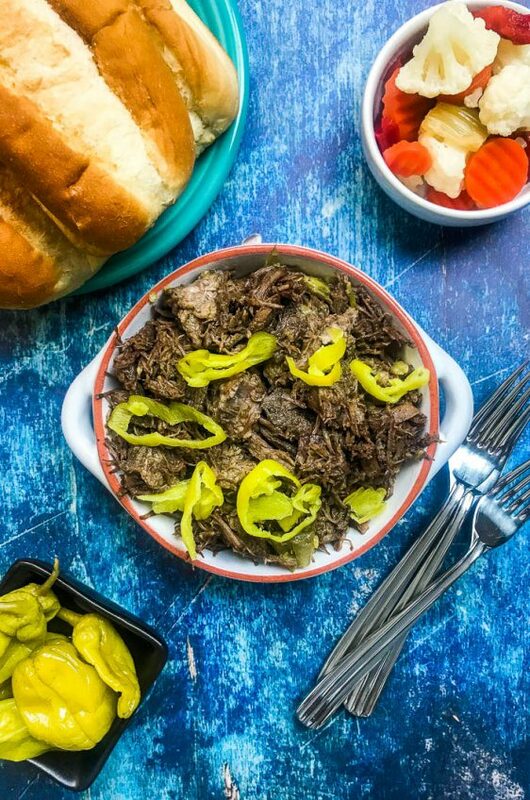 Because what is better than spending the whole day warm and cozy with the snow outside and the scent of pulled pork cooking in the slow cooker? 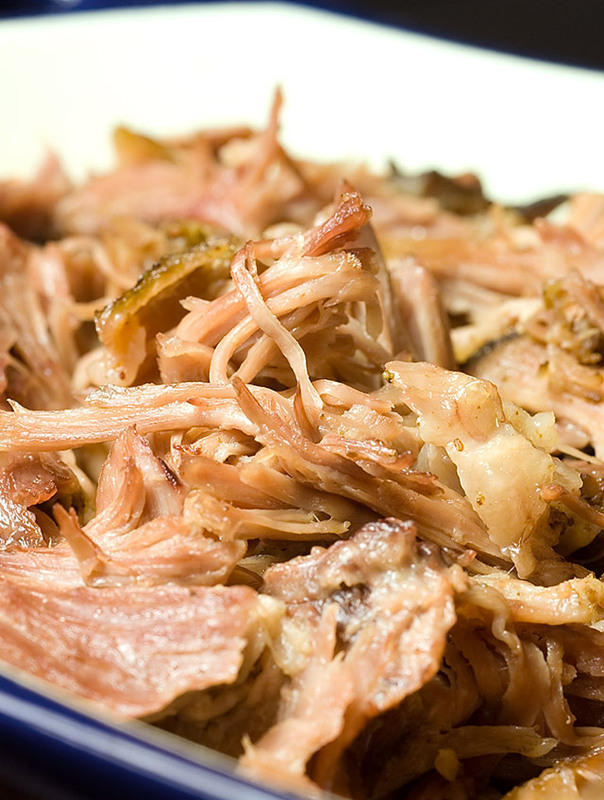 Pulled pork is always a favorite around here. I like to make it because I can use it for meals throughout the whole week. This is my go to recipe. This week I made pulled pork noodle soup (think chicken noodle but with pulled pork instead) and these Pulled Pork Tacos with Chipotle Slaw. I seriously just love slaw on tacos. Sure Pulled Pork Tacos are great and all but if you pile a cool, creamy slaw on top, then I am in heaven. This slaw gets the majority of its creaminess from greek yogurt so no mayo overload. Woot! My favorite part, though, is the chipotle. Obviously. I love having a can of chipotle peppers in adobo sauce in the pantry for those times when I want to add a little smoky heat to dishes. 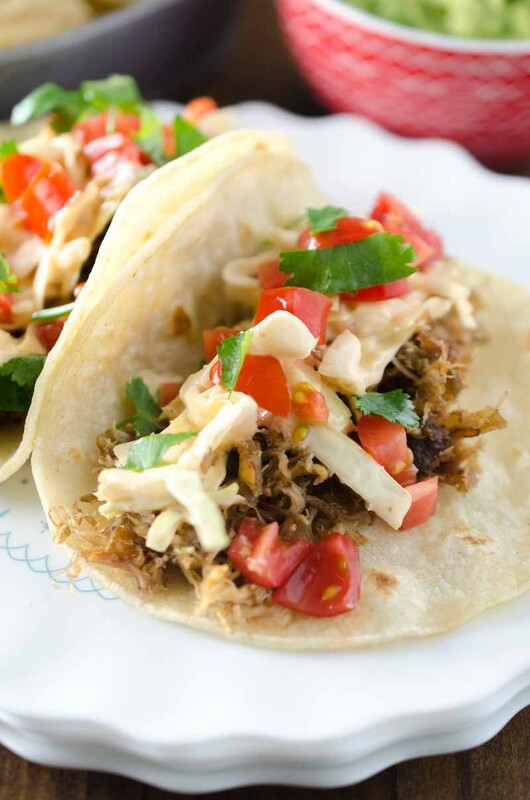 In these Pulled Pork Tacos with Chipotle Slaw, I made use of both the chipotle peppers and the adobo sauce. 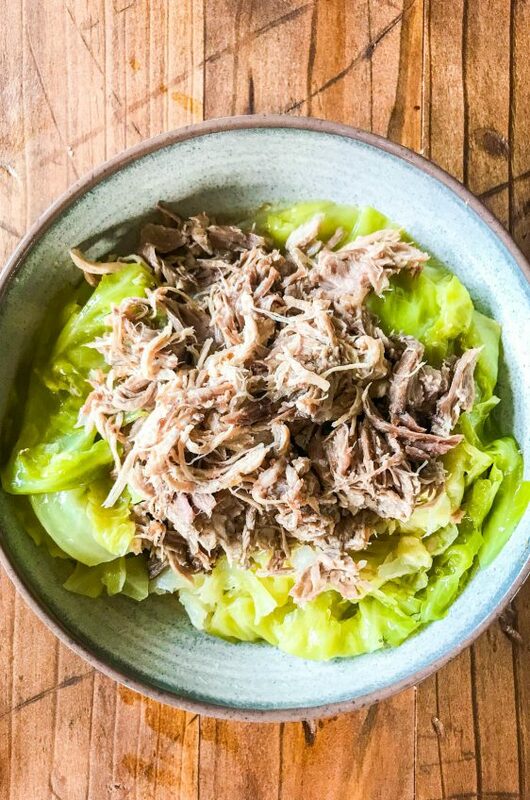 I chopped up the chipotle peppers to add to the slaw and then tossed a couple of teaspoons of the adobo sauce into the pulled pork while it was cooking. 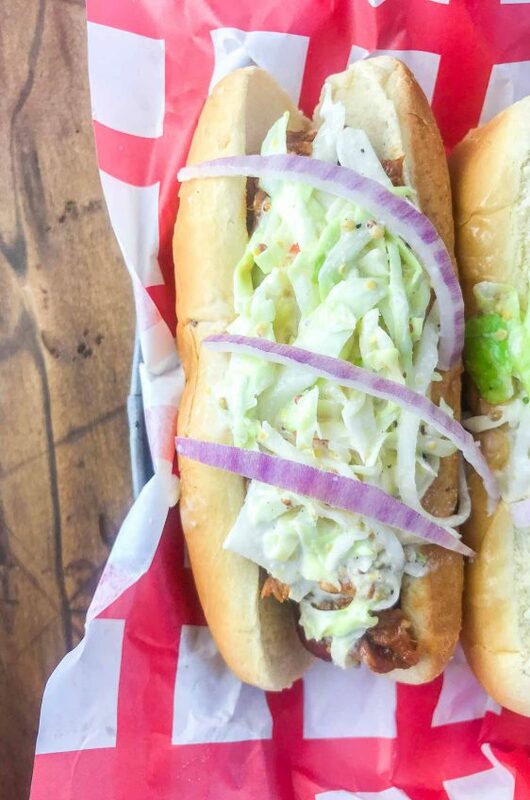 It gave each the pork and the slaw just the right amount of heat. Speaking of heat, the slaw itself is a little on the spicy side, but the pork was not. I left the slaw off the boys’ tacos because I thought it’d be a little too spicy for them. If you’re worried about the spice factor, start with one chipotle pepper and then add the second if you want more heat. Combine all of the ingredients for the slaw together in a bowl. Mix well. Cover and refrigerate for at least 30 minutes. Heat avocado oil in a pan over medium heat. Add in pulled pork, adobo sauce, cumin and garlic. Mix well. Cook until warmed through, season to taste with salt. Reduce heat to low and keep warm. In another skillet, add enough oil to coat the bottom of the pan. Fry tortilla over medium heat just until softened, about 30 seconds per side. Transfer to a paper towel lined plate and repeat until all tortillas are cooked. To assemble a taco, spoon pulled pork into the taco shell and top with chipotle slaw, diced tomatoes and chopped fresh cilantro. Serve. 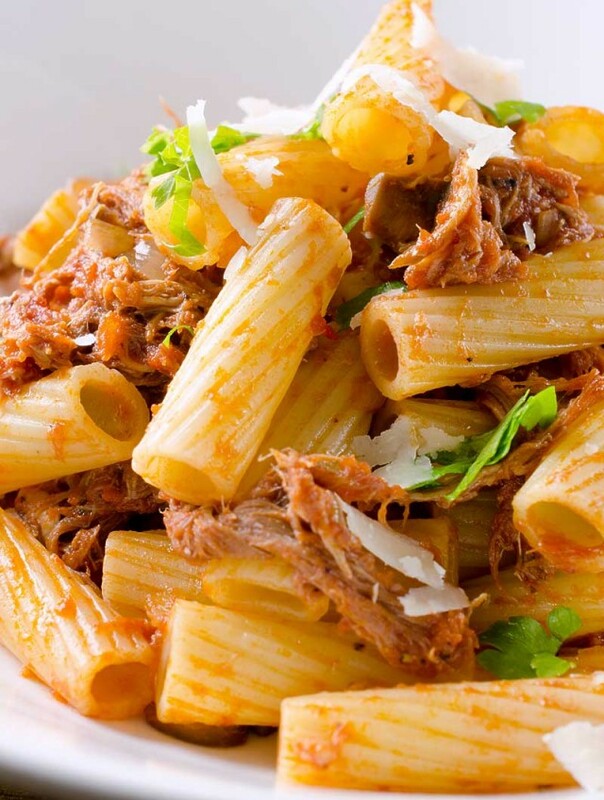 Oooo these need to happen for dinner soon! Oh my gosh and that Chipotle Slaw!! yum! 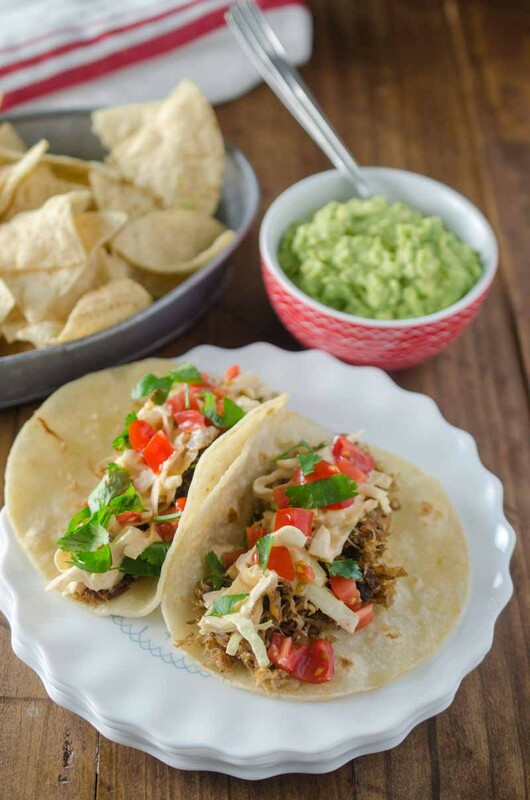 Pulled pork, tacos, anything chipotle…yes please! Those would be a huge hit in our house! So colorful and healthy. Such a great alternative for lunch. I know what we are having next Tuesday! Sounds delicious! Pork tacos are always a hit in our house! This needs to happen on our next Taco Tuesday! Your city sounds like ours with your snow day. 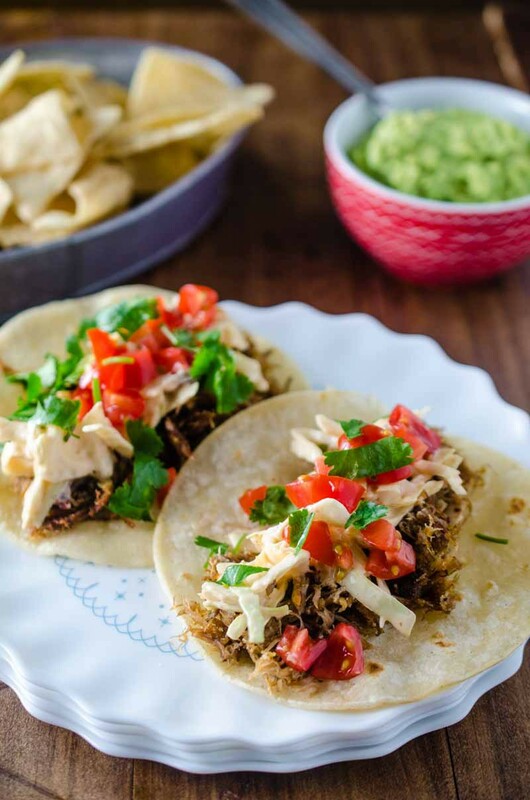 ;) And these tacos look like the perfect comfort meal for that kind of weather. I would love to try one of these!